Ted Cruz lost the Fox debate to Donald Trump. Ted Cruz didn’t have a great night at the debate in Des Moines, Iowa, on Jan. 28, 2016. The absence of Donald Trump from Thursday’s Fox News debate left Sen. Ted Cruz, typically the sharpest debater in this cycle, the opportunity to solidify himself as conservatives’ only alternative to Trump. He would be at center stage, the attacks would come for him, and he would fend them off one by one, in his usually unflappable style. 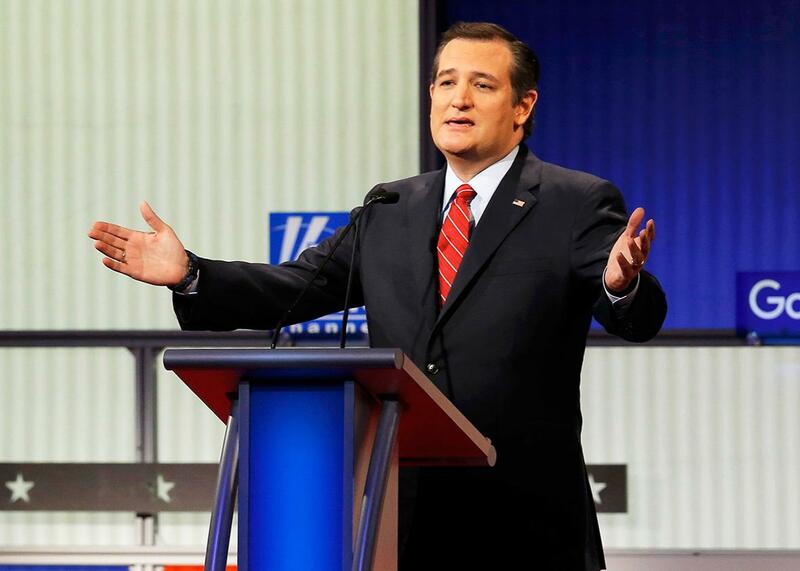 Cruz had his worst debate at a time when polls suggest he’s fallen well behind Trump in Iowa. Unless organizing can make up the shortfall, he needs to make something happen in the few days left. But instead of commanding the stage and hammering the absent front-runner, Cruz turned in a sloppy performance consisting of flat jokes, whining to the moderators, whining to the moderators as a set up for flat jokes, and taking substantive poundings from his rivals—and from Fox News itself. Cruz opened with a joke about Trump’s absence. “Let me say I’m a maniac and everyone on this stage is stupid, fat, and ugly. And Ben, you’re a terrible surgeon,” he began. “Now that we’ve gotten the Donald Trump portion out of the way…” The joke got a smattering of applause, certainly not enough to justify serving up footage of him saying “I’m a maniac” for his opponents to use for as long as he remains active in politics. One of the clichés about Iowa voters is that they don’t respond well to negativity. As a countervailing point, we present to you the fact that Trump is currently leading Republican polling in Iowa. Cruz had a chance to position himself directly against Trump as the alternative and rip into his record without fear of retort. Instead he continued treating Trump as the goofy, entertaining sideshow who will go away. When will they learn? “It is a debate, sir,” Wallace interrupted. The questions did not really pick on Cruz that much but apparently did meet the minimum threshold needed for Cruz to issue his other pre-prepared Trump joke. “I will say this, gosh, if you guys ask one more mean question, I may have to leave the stage.” Some confused laughter ensued. For some reason that we won’t question, because it was glorious, Fox News decided to spend a segment near the middle of the debate nuking only Sens. Marco Rubio and Ted Cruz with clips from their past on immigration. Rubio sweated plenty when his shifting positions over the years on “amnesty” were examined. Then it was Cruz’s turn to go under the knife. Fox went after Cruz’s shifting history on whether he supported offering legal status—the lesser “amnesty” behind offering citizenship, but an “amnesty” damning enough by this primary cycle’s standards—during the 2013 comprehensive immigration reform debate. Cruz denies he ever did, that he was merely engaging in clever parliamentary attacks, but the tape showed another story. It muddied the waters on immigration more efficiently than Rubio’s intensive efforts to muddy the waters late last year did. Cruz’s fellow senators piled on with some pent-up frustration. “I was there and I saw the debate,” Sen. Rand Paul laid in. “I saw Ted Cruz say, ‘We’ll take citizenship off the table, and then the bill will pass and I’m for the bill.’ The bill would involve legalization. He can’t have it both ways. Then in was Rubio’s turn: “This is the lie that Ted’s campaign is built on, and Rand touched upon it: That he’s the most conservative guy and everyone else is, you know, everyone else is a RINO. Cruz wasn’t anything special Thursday night, and it didn’t help later on either, when the moderators pointed out that Republican Gov. Terry Branstad, seated in the audience, had directly instructed Republicans to caucus against Cruz for his position on ethanol. Cruz on Thursday night wasn’t the dominating presence he needed to be. He was just another one of the people losing to Donald Trump.